Spring cleaning time for any business is often very tedious. Apart from worrying about the dirt and grime around the business environment and the best ways to clean them, there is often the worry of proper disposal of accumulated rubbish after cleaning. There is equally the worry about the possibility of damage to vital business setups and equipment during the cleaning process. This is why many ecologically friendly and financially savvy business owners rely on professional rubbish removal companies to take care of their spring cleaning. This piece takes a look at the advantages of using professional rubbish removal services for your business spring cleaning needs. Here are some ways to spring clean your business practices as well after you have a sparkling clean office. For businesses, spring cleaning is not a chore that can be done without adequate planning. Careful deliberations are part of the cleaning process to ensure that it is started and completed within the most favourable timeframe. With a professional rubbish removal service however, you can be sure of professional handling of your accumulated wastes in line with your schedule. The reliability allows business owners to go about the things that actually matter (bringing in new clients and taking care of old ones) whilst safe in the knowledge that their business property will be cleaned when due. During spring cleaning, there is always the danger of contaminating the environment with old paint, insecticides, unused raw materials and even solid waste such as paper bags and plastic containers. Professional rubbish removal services are well experienced in handling all kinds of waste including highly toxic chemicals and will take care to dispose them in an eco-friendly manner. 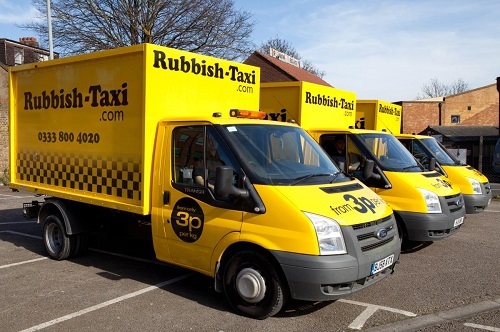 “Professional rubbish removal companies are experienced in the sorting and handling of all wastes and in many cases, you can communicate any requirements you may have for any specific types of waste” says the rubbish removal experts at Rubbish Taxi based in London. This means you can have your waste removed, sorted and sent to a farm of your choice (for organic waste) or a recycling plant of your choice (for inorganic waste). Professional rubbish removal services are often very cost-efficient because they have the capacity to handle all kinds of waste. You don’t need to pay separately for organic waste removal and inorganic waste removal instead you will only need to pay for the weight of waste generated. This ensures that your spring cleaning process will not be a costly one. Most businesses will embrace any process that will help them cut costs. Working with a professional removal companies is one of such processes. Many customers will appreciate a clean business environment. However apart from the enjoyment of a dirt free environment, your business image will be enhanced a great deal if customers can see that wastes are handled professionally. This is even more so today when an increasing number of people are becoming aware of their environmental responsibilities. Making your customers see that your business waste is handled in an ecologically friendly manner is a great way to demonstrate participation in a cause that many of them identify with. Professional rubbish removal companies are therefore a fantastic addition for any business today!